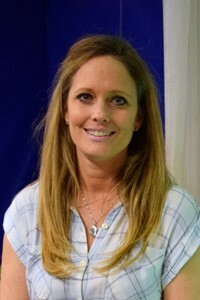 Shaler Area teacher Julia Igims will be recognized by the Autism Connection of PA as one of two Grandin Award finalists for her involvement and support of students who have autism. The Grandin Award, named after Dr. Temple Grandin, is given to acknowledge the individual who has most clearly contributed to “maximizing the potential and possibilities of children, adolescents and adults with autism in Pennsylvania.” This year’s winner is Shawn McGill, founder of Shawn McGill Consulting. Ms. Igims will be recognized as one of two finalists with Angela Lowden, founder and executive director of Art Expressions, Inc.
Julia Igims is a special education teacher at Marzolf Primary School and was also recognized as a semifinalist for the 2019 Pennsylvania Teacher of the Year. She has been an educator in Shaler Area for 20 years and currently teaches in an Intensive Support Classroom, which focuses on students with complex needs. Ms. Igims’ lessons concentrate on building foundational skills in students to help them master life skills throughout their education. Ms. Igims’ experiences in the classroom led to the co-creation of the Harbor Protective Sleeve with a fellow special education teacher. The sleeve, which is available through TFH Special Needs Toys, protects the forearms of students or teachers from aggressive, sensory-seeking, or injurious behaviors. Ms. Igims will be recognized at the Autism Connection of PA’s 18th Annual Gala, a fundraiser to be held on Saturday, October 13, 2018 at J. Verno Studio in Pittsburgh. This annual event is the organization’s single largest fundraiser, and enables the staff to provide year-long autism support and information.